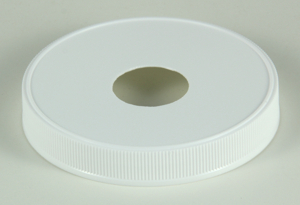 This is the replacement pump lid with a center hole for our Commercial Syrup Pump Bottles. The hole is about 1 1/16” diameter. It fits either the square bottle (item 89square) or the round bottle (item 89round). Size is 89 mm or about 3 ½” diameter and ½” high. Moveable Commercial Syrup Pump, CPmove, or stationary Commercial Pump, CPfixed, work with this lid.